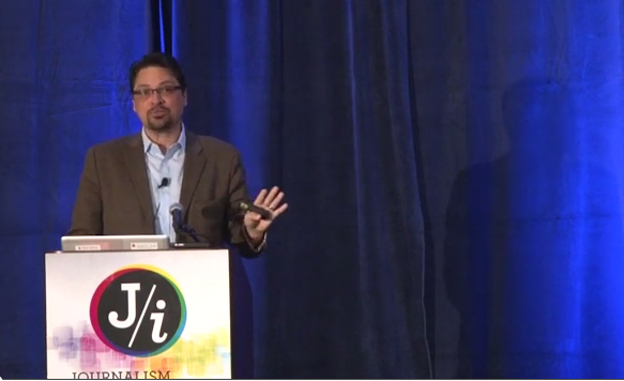 UC Berkeley's Koci Hernandez spoke at Journalism Interactive, a joint effort by the universities of Maryland, Florida and Missouri, focused on education and digital media. It took the Journalism Interactive conference fully three minutes this weekend to grab me by the scruff and inspire me to go all-in on more innovation. 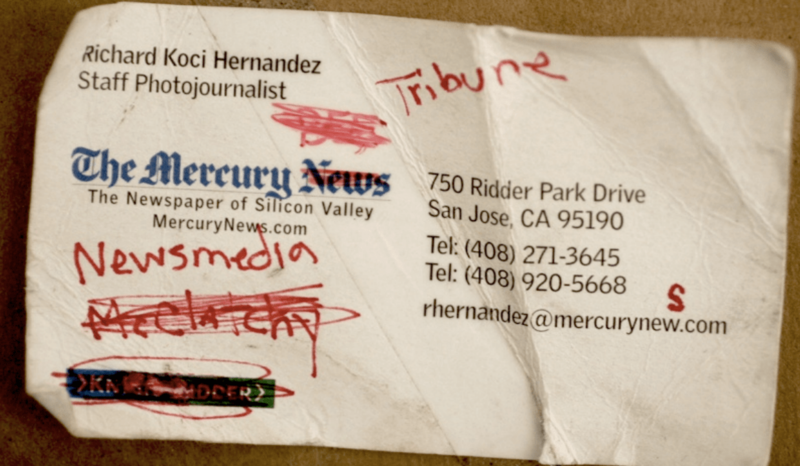 UC Berkeley’s Koci Hernandez took the stage and threw up a picture of his old business card. Tattered and torn, it laid out the shifting ground of digital journalism with the scrawlings of new owners and new incarnations that took over as he’s reinvented himself from staff photographer to multimedia journalist to college educator. "To me, that all points to people -- teachers, students and even administrators -- trying to ensure the trajectory of journalism education is headed up, not down. We must rise, not fall." It’s time, I thought, for my reinvention. Koci Hernandez has adapted to many changes during his career, including ever-shifting media ownership. I will not go down that way. I choose to rise not fall. Media futurist Amy Webb angered some attendees by challenging the relevance of a journalism degree. But she has a point. Any journalism program stuck in the gallows mentality of a declining news industry is writing its own obituary. Fortunately, I don’t see many programs like that. In our J-School, application numbers are up and quality is high. The people at J/i — along with the scores who attended the International Symposium on Online Journalism at Texas-Austin this weekend — spanned programs of all kinds across the nation — and the world. And the Challenge Fund to Hack Journalism Curriculum netted 125 proposals, easily three times what I expected them to get. To me, that all points to people — teachers, students and even administrators — trying to ensure the trajectory of journalism education is headed up, not down. We must rise, not fall. Here are just a few of the rockets I’ll be using to power that rise in my own work. Of all the insights and inspiration I gained from his talk, I thought Koci’s reading list was the best. He’s far afield from the traditional textbooks. I’ve been through a few of these, and they’re must-reads. But I’m committing to the list in full now, as soon as my finals are graded. Webb covered some interesting tech trends educators should know about though I remain skeptical that we can all be what she envisions. For instance, Webb is a proud advocate of thinking technology-first, not merely digital publishing first. It’s an interesting focus, and I may well buy the argument that news organizations need to become tech organizations. Amy Webb wants journalism professors to spend the summer updating their skills and insights. Where Webb soared, however, was in conceiving a summer curriculum for journalism profs who want to move forward. She’s laid out a roadmap for updating your thinking on emerging technologies, as well as the millennials we teach. It’s a workable trip through some important insights and ideas. I’ve committed to take some time this summer to get through it in full. Speaking of that summer curriculum, I’m not going it alone. Jeremy Littau from Lehigh has offered to work through it with me. We’ll support each other along the way and write about it for EducationShift. This was a massive lesson I’d learned before but embraced again at J/i: Teaching journalism is too hard to do alone. The ground shifts so quickly and so massively. The tools emerge in a blink. The range of content to be taught only seems to expand. This is why we need our gaggle of teachers to be a community of learners. I want EdShift to be a hub through which we all engage and help solve each other’s problems. But you can also find support through the active ONA Educators group on Facebook or the excellent Teachapalooza seminar coming up at Poynter in June (disclosure: I’m on that schedule for a variety of sessions). EdShift will be working hard in the coming year to bring you the stories of the winners of the Challenge Fund, as they wend their way through a dozen live news experiments. This community should be particularly helpful in sharing lessons learned, as well as materials that can be remixed in your own program. Poynter’s Al Tompkins — catalyst of so many of my reinventions and innovations — closes many of his seminars with a meaningful exercise. When you fly home, he says, listen to the flight attendant’s emergency instructions. In the event of a loss of cabin pressure, oxygen masks will drop automatically. Secure your own mask before helping another. That’s what events like J/i, places like Poynter and efforts like EdShift are all about. They’re the teaching oxygen you need to breathe in before you can set off to help your students. Take time for these moments and the people who inhabit them. If you do, we rise together. For those who couldn’t be there, thanks!, this is very helpful. Glad EdShift is part of that village.